The term bully is invading newspaper headlines, marching across the evening news, and dominating bestseller lists. Emily Bazelon’s new book, Sticks and Stones: Defeating the Culture of Bullying and Discovering the Power of Character and Empathy, is one of the latest examples of anti-bullying resources, and its examination of the origin of the word bully piqued my curiosity. As it turns out, bullies haven’t always been thought of as intimidating menaces. For English speakers in the 16th century, bully was actually synonymous with lover. How did the word’s meaning shape-shift so drastically throughout the ages? In the mid-1800s, Tom Brown’s Schooldays, a popular British novel, featured a violent “bully” named Flashman who snatched up lottery tickets and taunted schoolmates. Several decades later, a questionnaire asked American educators to provide examples of bullying at school. One teacher described a boy named Fletcher who would push smaller boys who would not obey him and then hold them down with his knee until they begged him to stop. By the turn of the century, “bullies” were certainly no longer sweethearts or lovers; they were looming figures—like Flashman and Fletcher—who evoked fear among their peers. Not until the 20th century did the word take on the more scholarly definitions we use today. Dr. Peter Paul Heinemann, an accomplished physician and Holocaust survivor living in Sweden, developed a theory about bullying after witnessing the local community’s hostility toward his adopted son, David, who is black. Heinemann looked to the behavior of animals—specifically mobbing, a violent, instinctual behavior of birds assaulting a weaker member of their own species—and in turn applied the concept to a group’s aggression against a particular child. A young Swedish academic named Dan Olweus considered Heinemann’s theory, but he disagreed with the idea that mobbing was a “crowd” behavior. Instead, as Bazelon describes in her book, Olweus contended that the opposite was true: Typically, a small group of two or three students would do the majority of the bullying that occurred in a class, and as many as 30 percent of children who were bullied had been victimized by the same person. When Olweus translated his 1978 book Aggression in the Schools from Swedish into English, he chose the English word bullying to describe these cruel schoolyard behaviors. 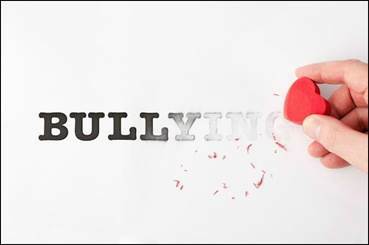 Over time, Olweus refined the meaning of bullying to include three conditions: Bullying is (1) repeated (2) deliberate verbal or physical abuse by (3) someone with more power than his or her target. The concept of bullying, it turns out, is not an easy one to translate across cultures. While similar terms exist in many languages, academic studies have demonstrated that there is seldom an exact match. The Japanese word ijime, for example, has a greater emphasis on social manipulation. In contrast, the Italian words prepotenza and violenza suggest more physically aggressive actions. Sticks and stones may break my bones, but words will never hurt me. As most any child knows, the playground mantra can be a flimsy shield from verbal abuse. Epithets, slurs, and insults can injure as much as physical violence, and many bullies expertly wield the abusive power of language. Yet words also possess the capacity to heal and to prevent further violence. The act of labeling an atrocity with a certain name can compel action—at the community, national, and/or international levels. Raphael Lemkin, a Polish lawyer of Jewish descent, recognized the potential of language as he coined the word genocide in 1944. Those who pioneered our modern definition of bullying—intentional and repeated verbal or physical abuse by someone with more power than his or her target—felt compelled to call a certain behavior by a proper name. Anti-Semitism in Nazi Germany and provincial racism in Sweden compelled Heinemann to define what he witnessed, and Olweus built on this research to develop the Olweus Bullying Prevention Program to help children like Heinemann’s adopted son, David. In your work with children and youth, do you see them correctly labeling bullying behavior? What prevention programs have you found particularly effective in helping children understand the meaning of bullying and how to respond to it? Please leave your comments below.